Addis Abeba, July 30/2018 – It is a very rare occurrence that inter-state peace negotiations or agreements are achieved in Africa or elsewhere for that matter without a third-party negotiator, often from the western world, sitting in the middle pace talk tables and holding the hands of the representatives of the disputants. Such negotiations often move around from one European, sometimes African, city to the other in a luxury hotel without an inch of progress. Habitually, peace negotiations are often bogged down with the mundane tasks of the agenda, procedure and protocol issues instead of substance. As a result, they drag on for years while women, the elderly, children, and everyone else suffer the consequences of war and conflict. However, this month something rare and extraordinary happened. Two neighboring states, Ethiopia and Eritrea, broke away from this long-held tradition of endless ‘peace process,’ where the ‘peace process’ itself replaces the peace, and accomplished what seemed unthinkable a few months ago: Ending a senseless war that followed a decade and half long “no-war, no-peace” state that had a devastating impact on both countries. The May 1998- June 2000 war between the two countries which was, on the surface, triggered by a piece of desolate land and had caused the death of more than 70, 000 people on both sides, with a colossal financial cost and devastation. In addition, the war and its aftermath tore families, friends and communities for twenty years. While technically the war ended in June 2010 the “no-war, no-peace” stalemate continued until all of it ended abruptly in two weeks’ of diplomacy at lightning speed. Although there are reports indicating behind the scene diplomacy by third party actors, particularity the UAE and Saudi Arabia, the willingness by both parties is undeniably clear. It is not a surprise that there were gentle nudges and invisible hands to encourage and support both parties to break the stalemate. Whatever the case, the leadership of both countries showed unwavering commitment to close an ugly chapter in the history of their bilateral relations and ushered in a new dawn. So, what has led to this historic peace agreement and dramatic change of relationship between the two countries? It seems clear that a special kind of leader has emerged in the person of Ethiopia’s new president, Abiy Ahmed. But is that only it? The study identifies distinctive aspects of Mandela’s peacemaking practice, as well as aspects that may be common among accomplished peacemakers and negotiators. It concludes that Mandela’s seemingly contradictory personality traits and high degree of ‘cognitive complexity’ allowed him to succeed the separate roles of partisan negotiator and of peacemaker, and equipped him, more so than other revolutionaries, for the transition to post‐liberation leader. This was clearly demonstrated as Mandela dedicated his life for inter-group reconciliation and the creation of a ‘rainbow nation’ South Africa that is free, democratic and inclusive. Once Mandela himself described the peacemaking qualities of a leader in the following terms: “Like the gardener, a leader in peace negotiations must take responsibility for what he cultivates, he must mind his work, try to repel enemies, preserve what can be preserved and eliminate what cannot succeed.” The peacemaking efforts of the new prime minister of Ethiopia appears to be motivated by a genuine desire and understanding of the importance of peace for both peoples instead of political calculation. His normative statements and symbolic acts are testaments of his sincerity and belief system. The conclusion in Lieberfeld’s study was that Nelson Mandela was well equipped for reconciliation-oriented leadership. Clearly, he was not interested in a retributive form of justice; instead he advocated and worked towards restorative justice in South Africa. The quote here summarizes Mandela’s mind set and what he had in mind for South Africa as he walked a free man after twenty-seven years of prison under the apartheid regime: “As I walked out the door toward the gate that would lead to my freedom, I knew if I didn’t leave my bitterness and hatred behind, I’d still be in prison.” The point here is holding into bitterness and anger one cannot make peace with self and others. In any negotiation, demonstrating the willingness to travel an extra mile goes a long way. Perhaps this was the first strong message that captured the attention of the Eritrean side. Hosting the Eritrean delegation, the prime minister and his team showed genuine desire to welcome the delegation with open arms. Here the tone for peace was set. When Prime Minister Abiy Ahmed arrived at the Asmara Airport on July 8, 2018 the tone was already set. From the very first moment they met, both leaders appeared as if they were long lost friends. They embraced each other with a genuine affection. Since his ascension to power four months ago, Prime Minister Abiy Ahmed’s essential message to his domestic and regional audience has been consistently about peace, reconciliation, unity and regional integration. He argued that fragmentation, both at the national and regional level, doesn’t benefit the public, except the few with their own political agenda to dominate and control economic and political power. In doing so, he stirred a new and positive spirit to a country that desperately new story and genuine inspiration. His message resonated with the young and old, men and women both inside and outside the country. ‘Only peace can lead to peace. There is no other path,’ he retorted in one of his public lectures. So far, domestically and regionally, he has proven to be a great peacemaker and the collective hope is that he continues in this path. The energy and optimism he unleashed in Ethiopia and elsewhere is something unseen in the recent history of the country. Yes. Personality traits of parties in dispute and the third-party negotiators could have a ‘make or break’ influence, not only in the process of peace negotiation, but also on the outcome. The greatest peacemaker of our time, Nelson Mandela, said, “As I have said, the first thing is to be honest with yourself. You can never have an impact on society if you have not changed yourself… Great peacemakers are all people of integrity, of honesty, but humility.” One of the contributing reasons that peace negotiations often falter is the influence of personalities of the conflicting participants. Leadership that is shackled by ego and an ‘all or nothing’ attitude is counter intuitive to peace and reconciliation. 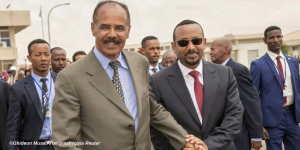 For an external observer, the Ethiopian Prime Minister Abiy Ahmed and the Eritrean President Isaias Afwerki appeared to experience ‘peace at first sight’. In his devotion for peace, the Ethiopian prime minister even broke away from the established diplomatic protocol and personally went to the Bole International Airport to welcome the Eritrean delegation led by Minister of Foreign Affairs Osman Saleh Mohammed. In doing so, he communicated to his counterpart that he is sincere and serious about peace. Most importantly, he sent a humble message that this is not about him or any other individual, but something much bigger and much important. Furthermore, he showed to the people on both sides of the border and to the world at large he is willing to travel an extra mile. Literally. For peace negotiations to be successful and enduring, they have to be much more than handshakes and smiles between the leaders. They must involve and engage the public, who are directly affected by the conflict and war. The truth is the dark and tragic side of war plants the seeds of hate and animosity between people who in most cases never met. They have similar needs for security, recognition, economic justice and all forms of rights. Hence, the hunger for peace and security was clearly demonstrated upon the arrival of the Ethiopian prime minister in the Eritrean capital of Asmara. The genuine and spontaneous emotional expression by men, women, young and old on the streets of Asmara was incredibly moving. Risk-taking is an increasingly crucial part of leadership and is paramount for a leader’s success. The obstacle at the center of risk-taking is fear; fear of failure and fear of success. 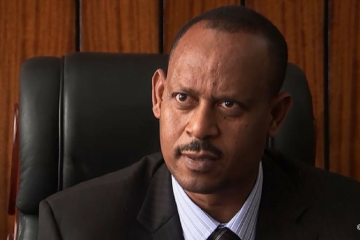 When the Ethiopian prime minister delivered his inaugural speech on April 2, 2018, he made it crystal clear that he is willing to resolve the deadlock with Eritrea. In doing so, he conveyed a message that the status quo is unsustainable, and he is willing to take a risk to try to change the relationship between the two countries. His risk-taking leadership is not limited only on the issue of relationship with Eritrea; he has demonstrated in his domestic policy, as well, with an unequivocal message to both his supporters and detractors he is in charge. This quickly gained him massive political capital and unconventional mandate without an electoral win. Both leaders know war and its devastating impact intimately. During a question period in the parliament, the prime minister forcefully and emotionally described his intimate knowledge of war and what it brings: “I buried my cousin who was raised by my mother at Badme front,” he said. “He was like a brother to me.” “I was there at the height of the battle,” he said, stressing his experience as a senior officer in the Ethiopian Defense Forces during the Ethio-Eritrean war. For those who declare war while sitting in their palaces or luxury homes, it is an abstract concept. There are important lessons from Ethio- Eritrea peacemaking efforts. The foremost among these is heeding to the pain and suffering of the people on both sides of the border. Families separated, economies have been shattered and the uncertainty reality of ongoing war has had an enduring negative impact on both peoples. While the scars of war are still evident, the healing process has begun. Lost family members are being united, and the restoration of transportation and communication lines between the two countries is the part of the road to recovery and healing. The road to recovery will be long and hard. It requires serious dedication from both governments and the people. Peacemaking is much more complex and difficult than making war. However, with bold and courageous partnership, leaders can achieve what often seems impossible. Fisk, Robert. The Great War for Civilization : The Conquest of the Middle East London: 2006.